The fact of the matter is that toddlers are notoriously picky eaters. Even if you’ve been blessed with a relatively ‘good’ eater, chances are you’ll hit a few road blocks where they refuse the good stuff and beg for basic toddler favorites. Thankfully, there are a lot of easy ways to get around this kind of picky eating and still provide little bodies with the nutrients they need to grow big and strong. 85% of brain growth happens in the first three years of life. That means as parents this is an important time to nourish little noggins and aid in them reaching their full potential. 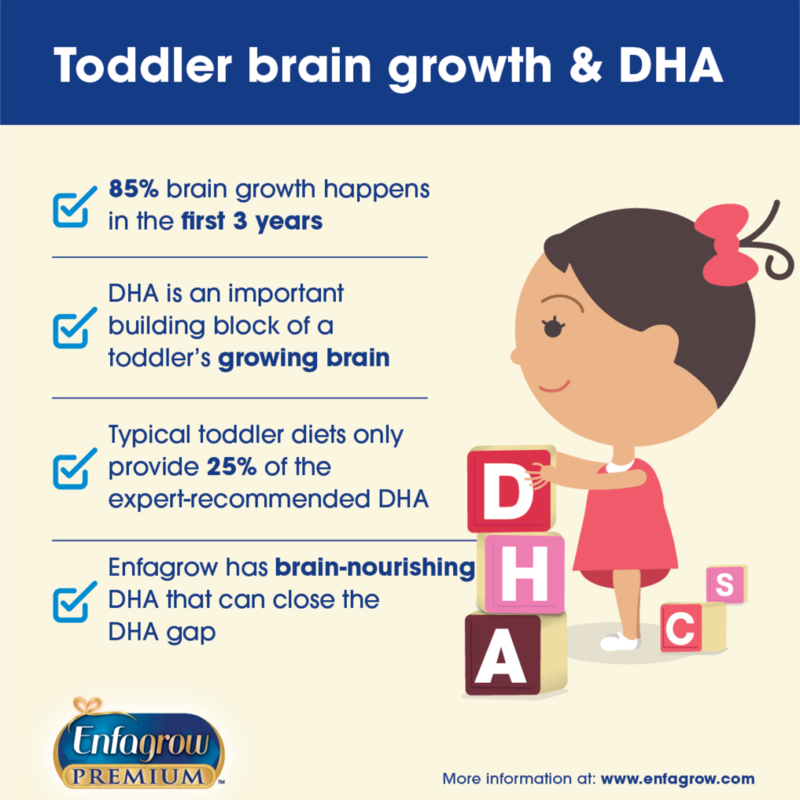 In order to help this growth, experts recommend that toddlers have 70-100 mg of DHA – an important building block of the growing brain – each day in order to help support early brain and eye development. Here’s where the problem comes in: on average, a toddler’s diet provides about 25% of the recommended amount of DHA. The main source for DHA is fatty fish and I don’t know about your littles, but my boys cannot be persuaded to eat fish, no matter how hard I try. Even worse, toddler favorites like cereal, cheese, bananas, regular milk, chicken nuggets, mac & cheese, carrot sticks and fruit puree all have 0 mg of DHA – and to be totally honest, those are the vast majority of the items I consider ‘surefire’ foods for the boys. 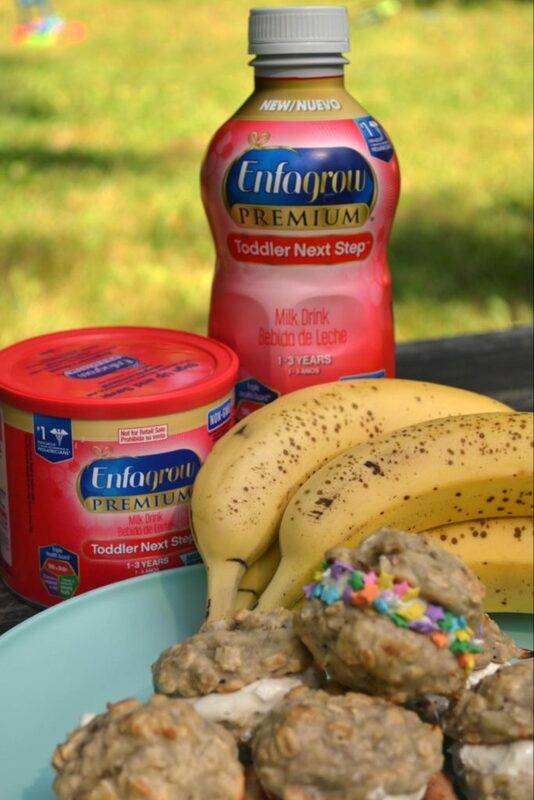 Luckily, we live in a time where products like Enfagrow® Toddler Next Step™ exist to help moms get their toddlers important nutrients without having to stress about how to get it into picky eaters. 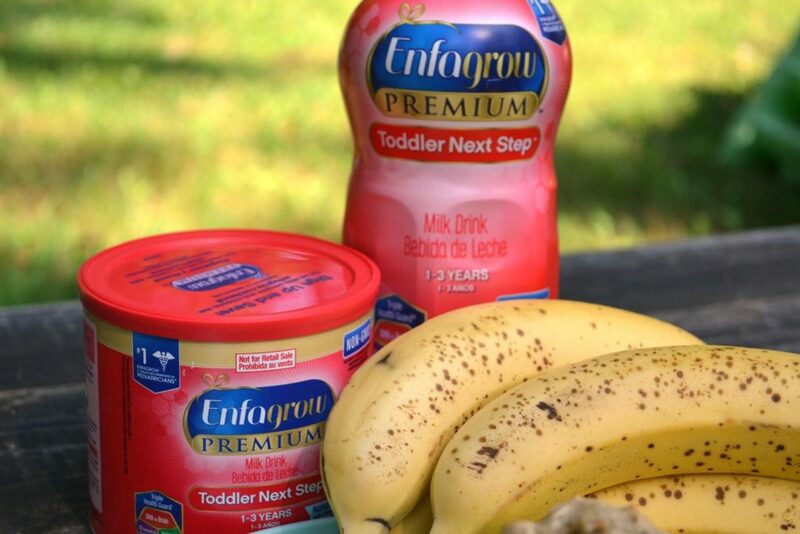 Enfagrow Toddler is a milk-based toddler drink tailored for toddlers 1-3 years that has DHA and complements their diet to help ensure good nutrition for their changing needs and tastes. 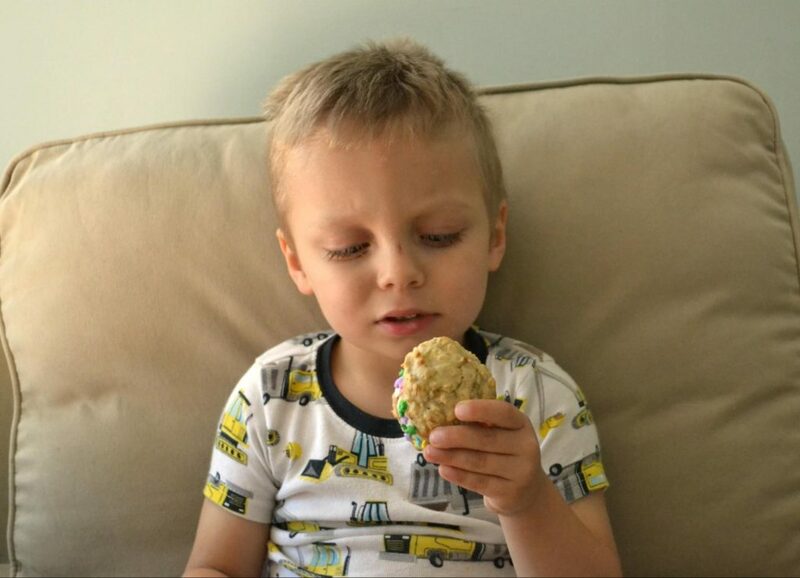 Enfagrow Toddler helps bridge the nutrition gap that typical toddler diets create. Today I’m sharing a fun recipe for breakfast whoopie pies that utilize Enfagrow Toddler powder that has DHA and other nutrients to help round out the boys’ diets while secretly giving them something they will totally love. 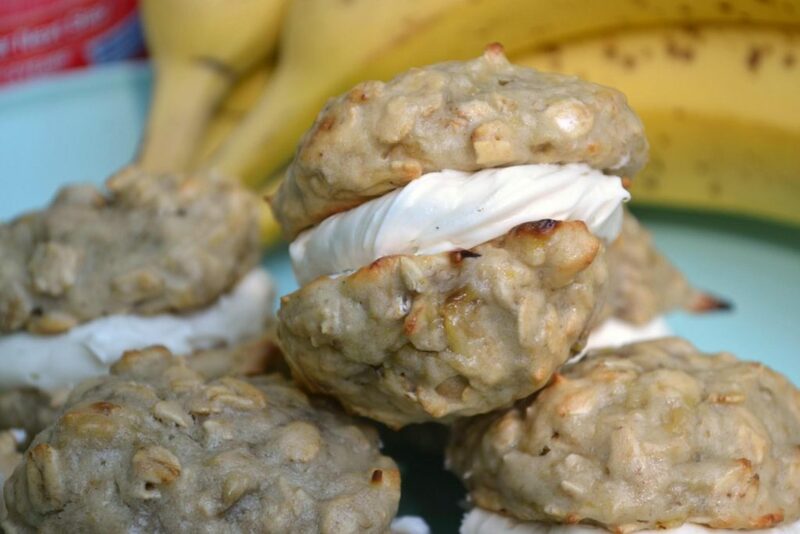 These breakfast whoopie pies are a fun twist on a favorite sweet snack that uses 2 soft cookies sandwiching frosting. 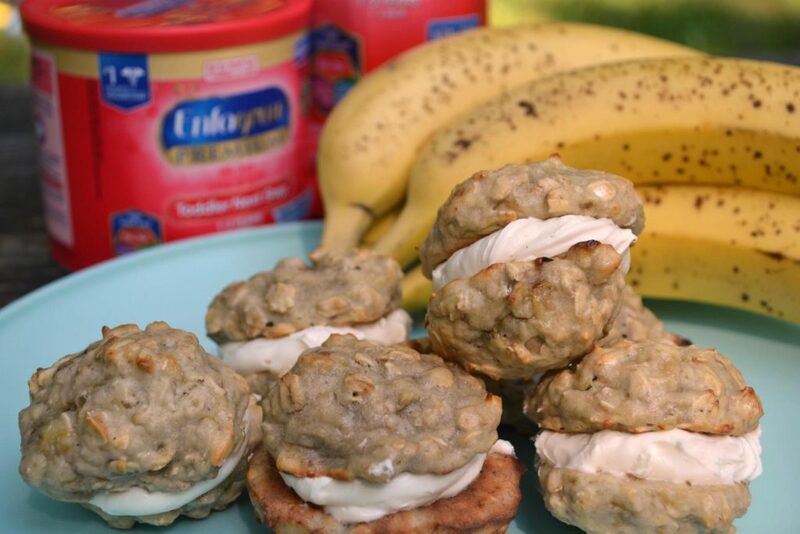 Instead of cakey cookies and sugar packed frosting, use easy banana cookies and a Greek yogurt and cream cheese filling to make a balanced breakfast on the go. Preheat oven to 350. In a bowl, mash the bananas well with a fork. Add in all cookie ingredients except for the flour and mix well to combine. Finally, mix in the flour gently until just incorporated, being careful not to over mix. Scoop onto a lined cookie sheet (I used a tablespoon cookie scoop) and bake for 8-10 minutes until set and lightly golden. Allow to cool completely. In a stand mixer or a bowl with a hand mixer (you could also use a whisk but who has time for that?) whip your softened cream cheese until light and airy. Add the other ingredients and whip to combine. To create breakfast whoopie pies, take one cookie and dollop about 1 rounded tablespoon of filling on the center of the flat side before gently pressing another cookie on the opposite side. Refrigerate to set. Use within 2 days. Optional: roll and press sprinkles into the side of the whoopie pie for an added splash of fun! 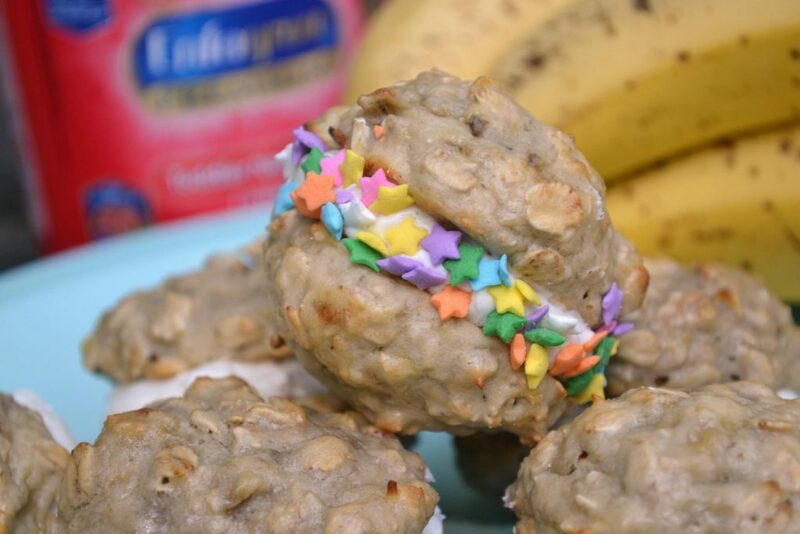 Breakfast whoopie pies are an easy, portable breakfast that your toddler will love – and Enfagrow Toddler powder offersyour little DHA to help support brain development and prebiotics that help support the immune system, as well as other important nutrients that your toddler probably doesn’t get enough of. Want to try out Enfagrow Toddler? Visit http://bit.ly/2x4rdaN to learn more and request free samples. I love this idea for breakfast cookie sandwiches! And my boys would be all about the sprinkles.